I see a lot of things in my travels that just make me scratch my head; and after yesterdays find I decided that they deserve their own little space on my blog. So I’ve created a new category, “What Were They Thinking?” to house those sad but true examples of access gone bad. To be fair, in most cases the intentions were probably good, but the end results just went horribly wrong. Still it’s a big swing and a miss. Today’s entry comes from a rest stop in Southern California. Although you can’t really tell from the photo, there’s over 40 inches of clear space on the side of the toilet. That’s great, as it allows people plenty of room to transfer, but there’s still one small problem with the setup. Take a look at the placement of the toilet paper — that’s quite a stretch for most people. Truth be told I was able to hold on to the grab bar and lean over and grab a few sheets. Admittedly it took a few tries though, and I have to add that I’m pretty tall and have long arms. I’m sure some of my shorter friends wouldn’t fare so well. 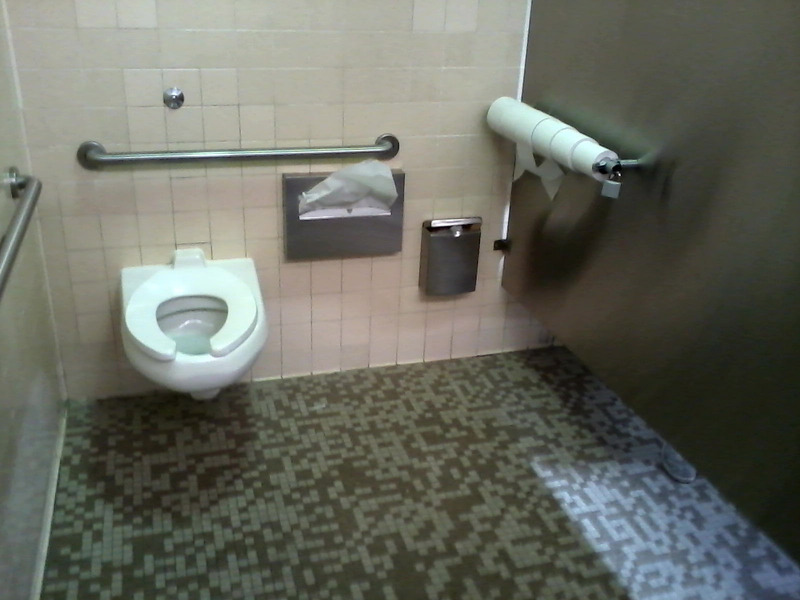 The sad thing is, the toilet paper holder could have been easily installed on the wall closest to the toilet. What were they thinking? Bottom line — thumbs up for the transfer space, but a big fat raspberry for the toilet paper placement. My Life Really is in The Toilet!! This entry was posted in What Were They Thinking? and tagged access, accessible travel, bathroom, disabled, grab bars, rest stop, toilet, transfer space, wheelchair by Candy B. Harrington. Bookmark the permalink.